Deepcool have more than their fair share of products that make a visual statement. 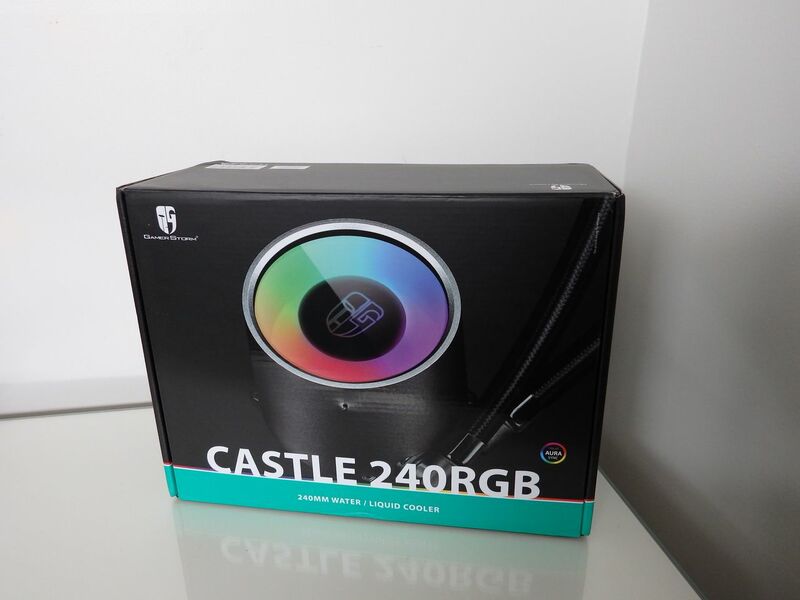 Let’s add the Castle 240RGB All-in-one water cooler to the list. 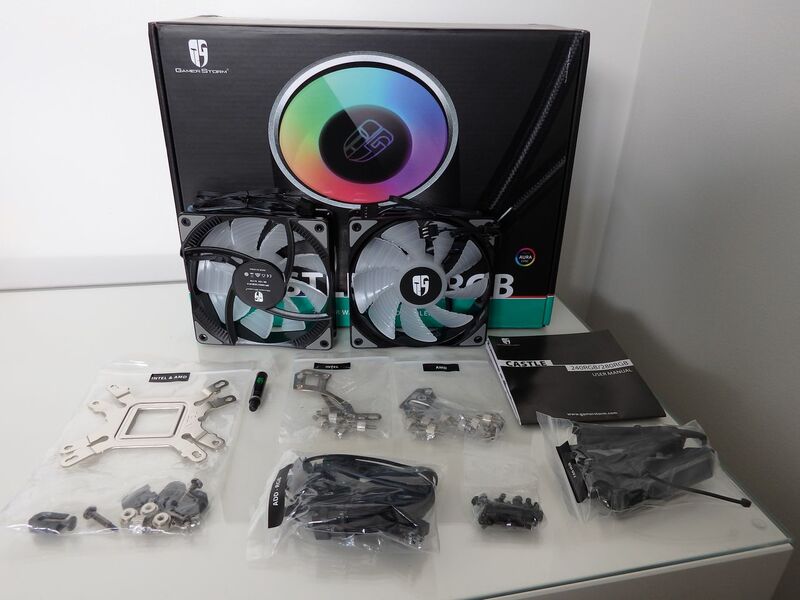 For something different with this review, we received a second unit from Deepcool to give away to a lucky reader so read on to find out how to score a brand new Castle 240RGB for your rig! 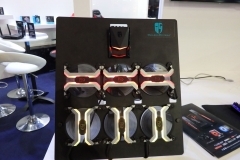 I’ve had the opportunity to get hands on with some impressive Deepcool products in the past. 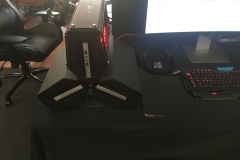 The Tristellar case is probably the most memorable. 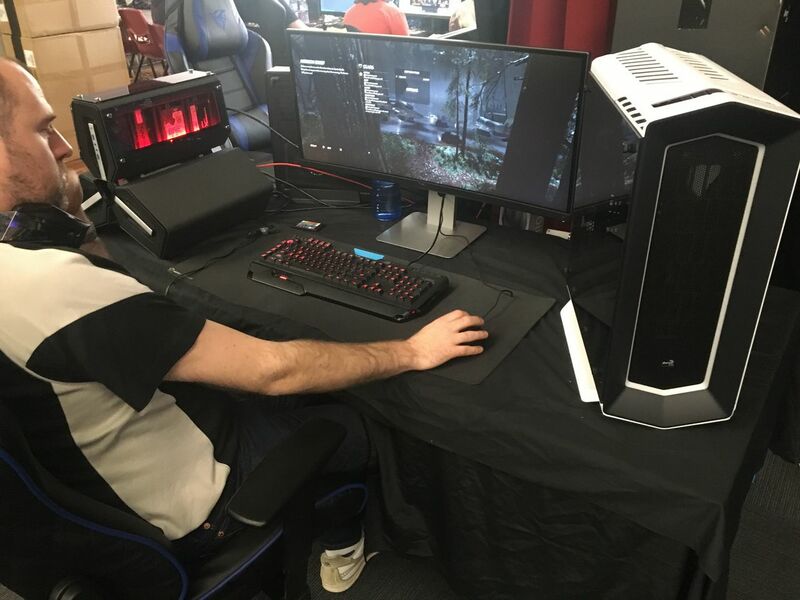 We built a showcase PC for Respawn LAN a couple of years ago in the Deepcool Tristellar and then gave the case away to a lucky LAN attendee. 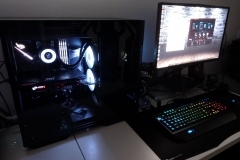 The case was distinctive and attracted a lot of attention. 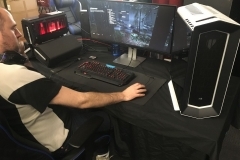 At PAX AUS in Melbourne last year Deepcool were showing their impressive Quadstellar case and frameless MF-120 fans – also very distinctive. 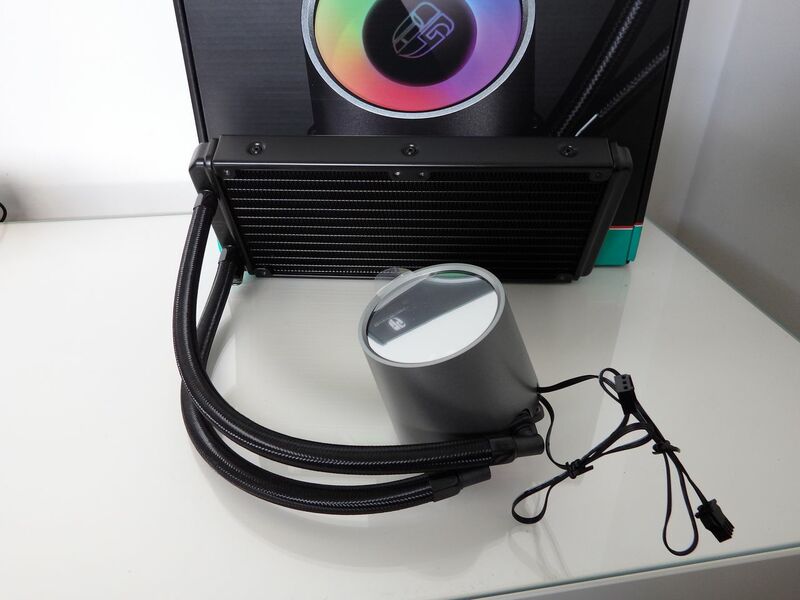 Now that we’ve established Deepcool’s track record in unique designs, let’s check out the Castle 240RGB water cooler. 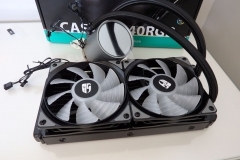 The Castle 240RGB is an all-in-one water cooler with a 27mm thick 240mmx120mm radiator. The hoses are thin and quite firm but they have a braided sleeve that makes them look good. 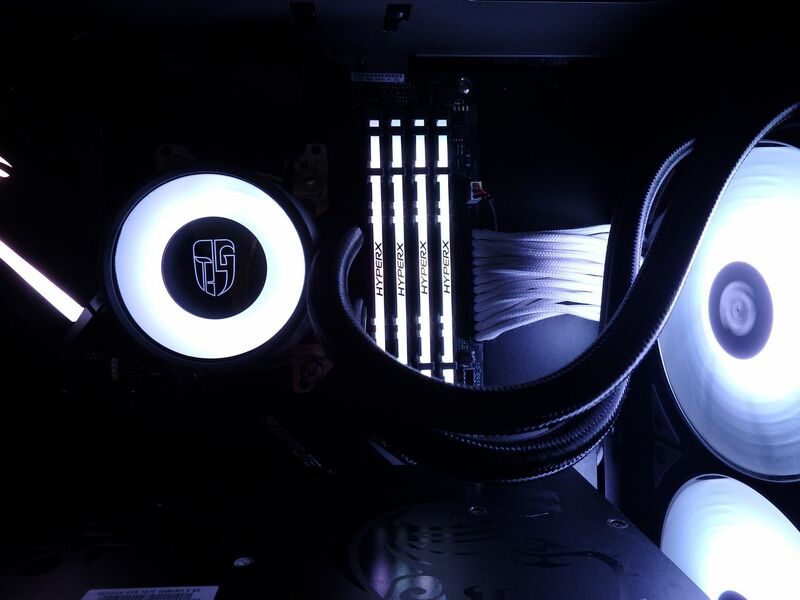 The sleeving also gives them a matte finish so they don’t reflect light which is important in this case. 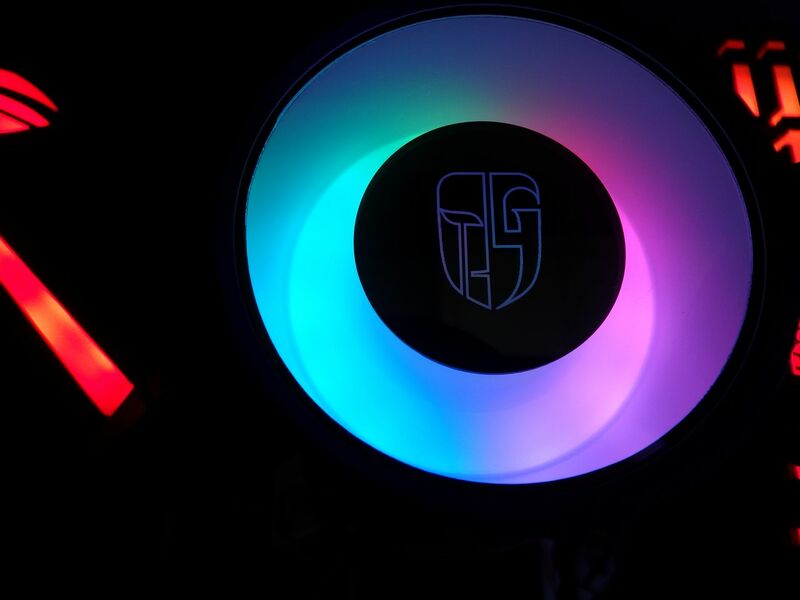 The pump block has a mirror finish on the top that lights up thanks to some RGB LEDs with the Deepcool logo in the middle like a hologram and the fans on the radiator are also RGB LED lit. 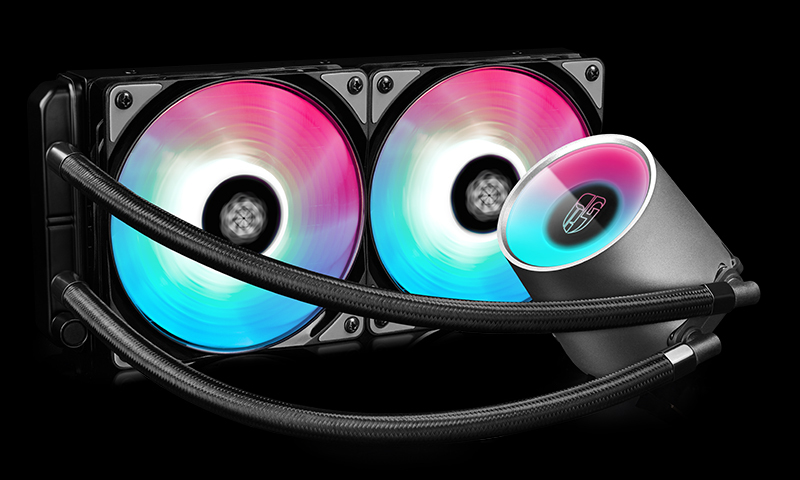 The matte finish on the hoses makes them less obvious than if the hoses had been gloss/semi-gloss rubberised plastic as we’ve seen on some other AIO water coolers. 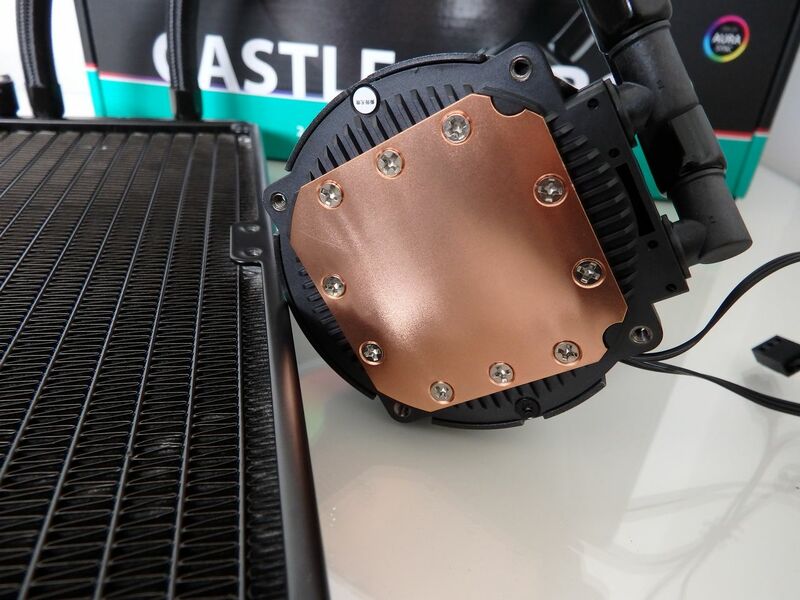 The water block is the hero and focal point of the Castle 240RGB, as it should be. The LEDs blend well together and the individual LEDS are not distinguishable. 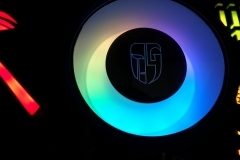 I haven’t seen another design that looks anything like it aesthetically, it’s very quiet, has a larger than average pure copper contact plate and is easy to mount. The pump works at 2550 (±10%) RPM and uses about 2.5W / 0.2A of power. 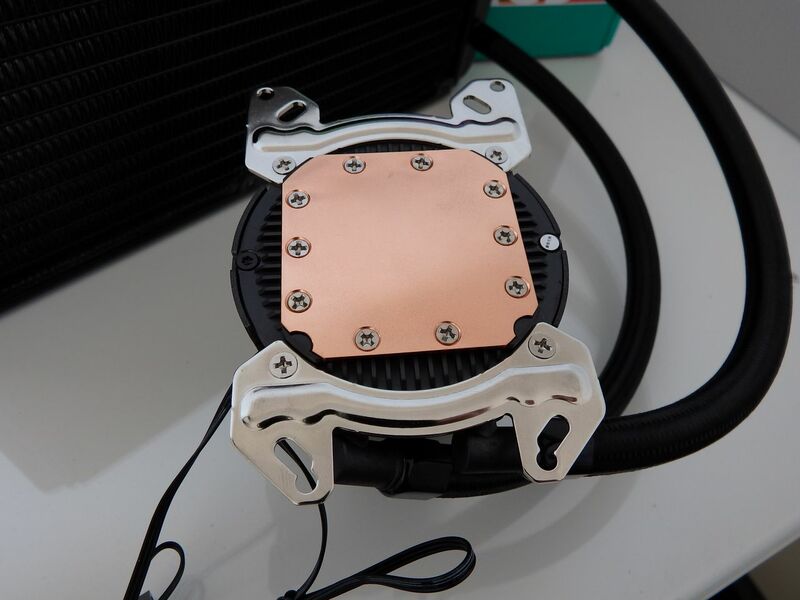 Mounting the CPU block is simple and the included thermal paste seems to be good quality, spreading evenly and not appearing to have any issues with the heat transfer. 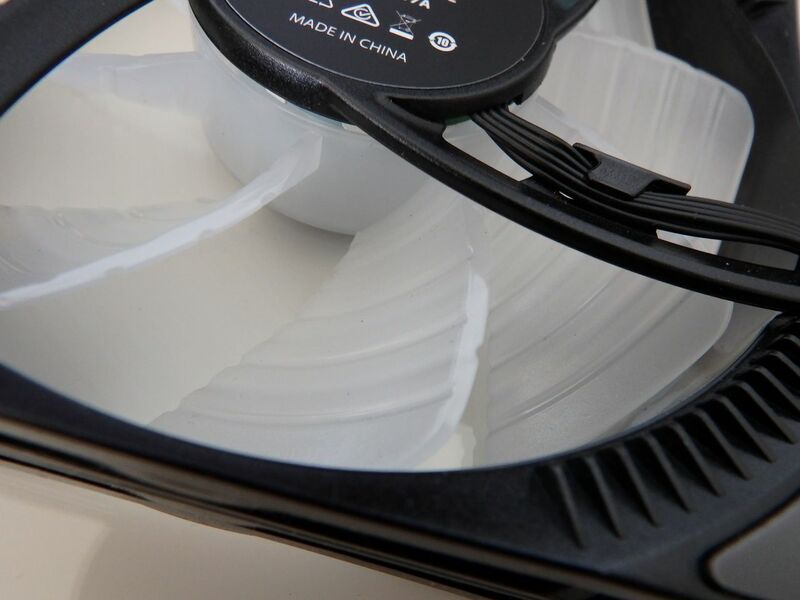 One of the key features of the pump is the use of ceramic axle bearings and cores for longevity. 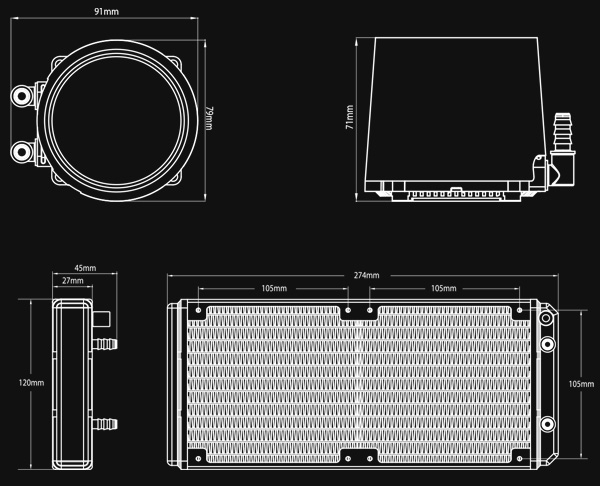 The radiator uses an E-shaped micro water channel to increase the surface area available whilst maintaining efficient circulation. 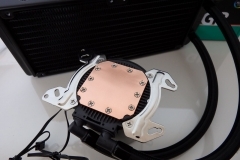 Our testing proved that the radiator design was effective in cooling the water inside with the included fans. Looking at the radiator, I couldn’t help but feel it was a little thin. 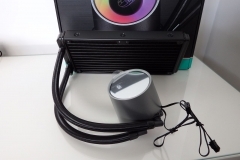 I’ve used water coolers similar to the Castle 240RGB before with thin hoses and radiators. 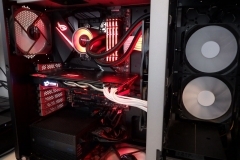 Expectations are important – the pump specs are good so it should be able to move enough water but the radiator and fans still have to execute the heat exchange. 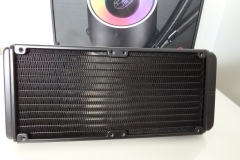 Thinner radiators typically have much less surface area than thicker radiators which means more airflow is required at the cost of more noise. 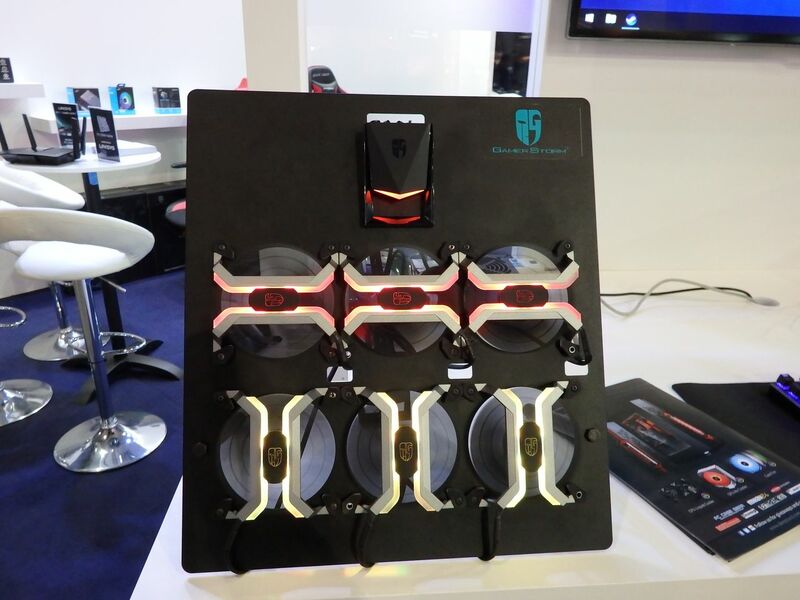 Deepcool’s included 120mm fans have opaque fan blades that are RGB lit from within the fan hub. The effect is a bright centre that carries to the tips of the blades. 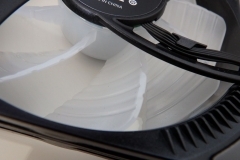 There are grooves on the blade surfaces to focus/manage the airflow and rubber pads on the corners to dampen vibration. 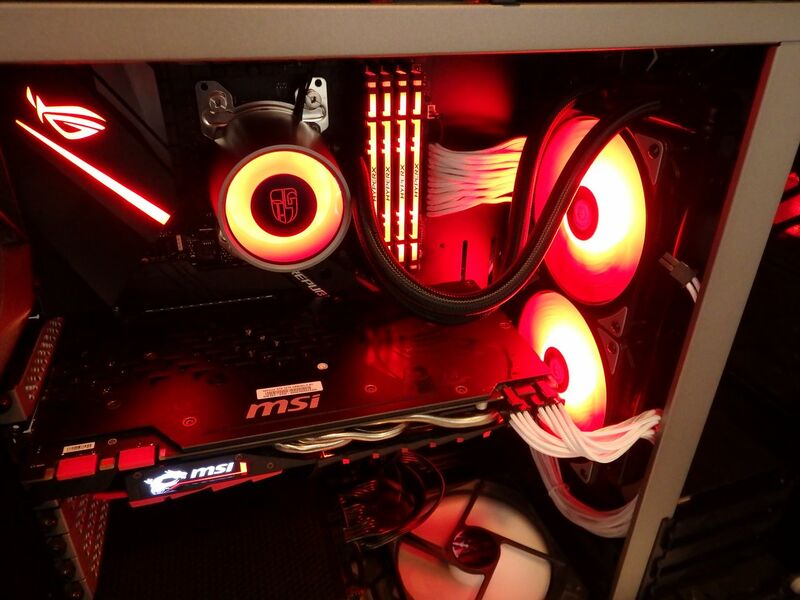 Both fans are 4-pin PWM controlled and spin from about 500-1800 RPM (give or take 10%). 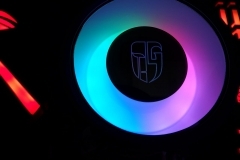 Addressable RGB lighting is well implemented, running from the Addressable RGB header on the motherboard. 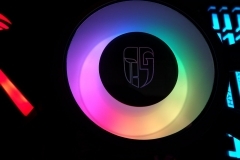 Don’t have an Addressable RGB header? 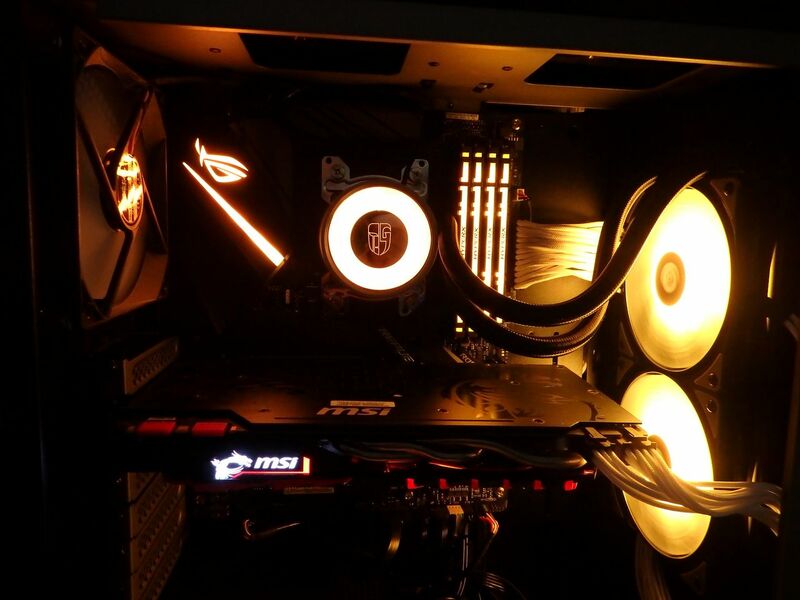 No drama – Deepcool also include a wired controller so that you can set the mode, speed and colour of the lighting. from 16.7M available colours. There are two breakout splitters, a 4-way LED splitter for RGB lights and a 4-way PWM splitter for fans. 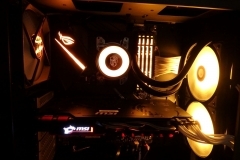 The ASUS AURA SYNC software on our ASUS ROG STRIX X470-F Gaming motherboard saw the Addressable header as a strip and synchronised it without a hitch and the RGB LEDs were a good match to the HyperX Predator RGB LEDs and the LEDs in the rear I/O shroud on the motherboard. Aesthetically, the end result was stunning. When testing, we only compare the results from the 12V / Full Speed runs as this shows the best performance possible from the solution. 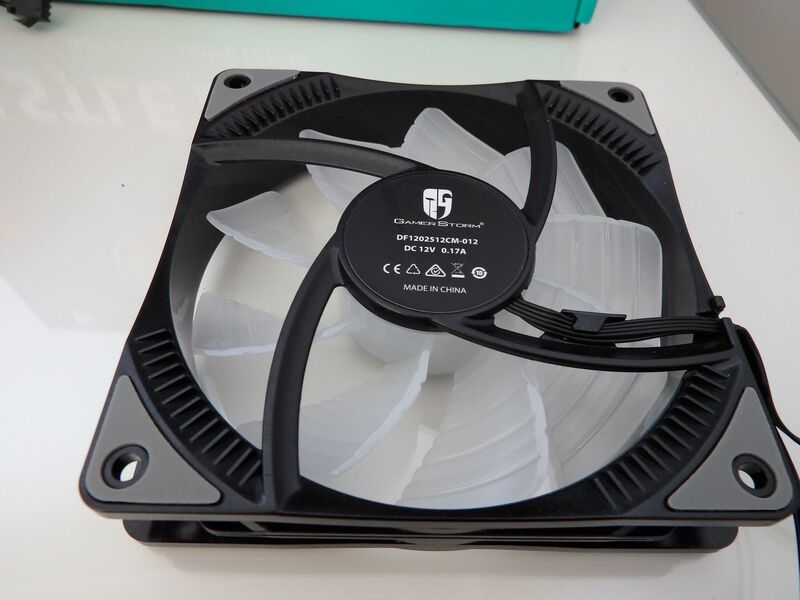 PWM fan curves can make some products look better or worse than they really are. 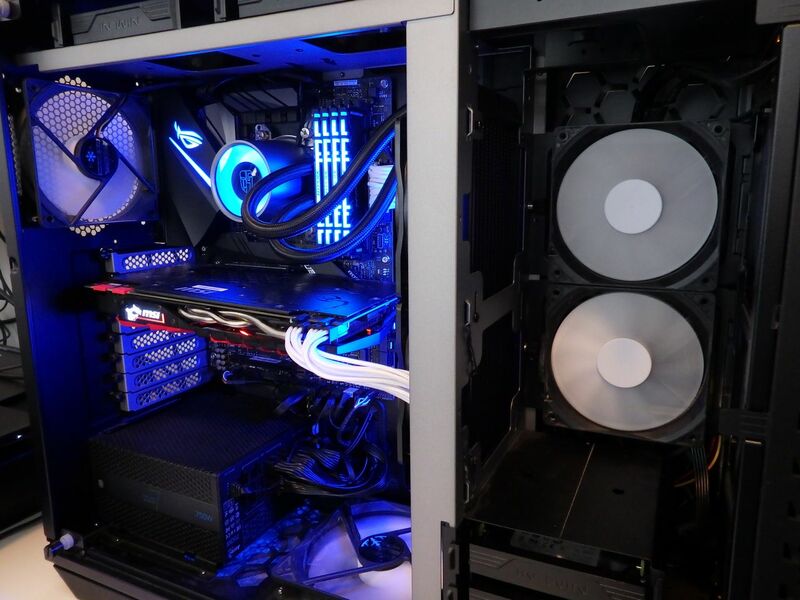 The three coolers we compared were the AMD Wraith Prism that comes with the Ryzen 7 2700X, the Deepcool Castle 240RGB and the EK XLC-240 Predator cooler. 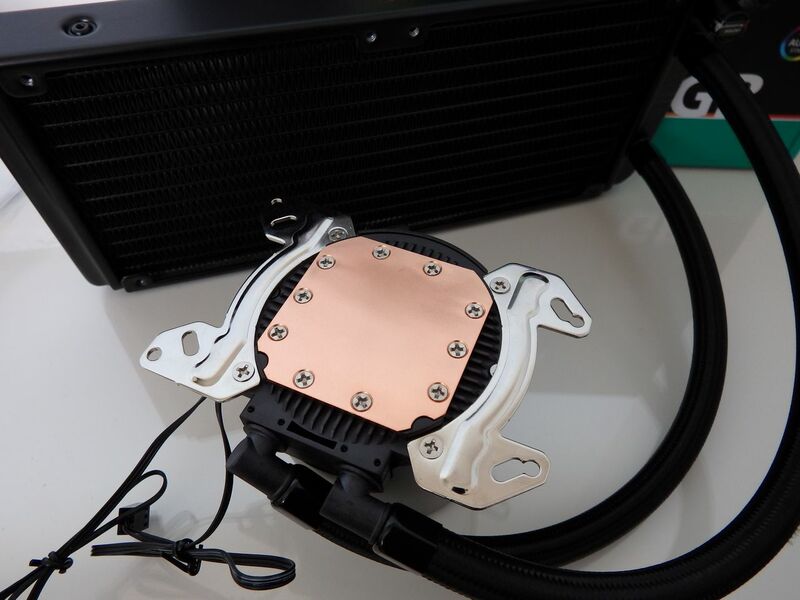 This isn’t a fair comparison as the EK water cooler’s hoses are twice as thick, the radiator is also almost twice as thick and the copper contact plate is also larger. 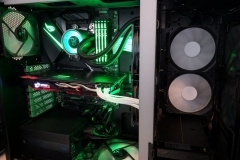 The EK cooler costs about $110 more than the Castle while the stock Wraith Prism cooler is essentially free with a Ryzen 7 2700X CPU. The peak delta and actual temperature readings are in the table below for comparison. What we can see is that the larger surface area and likely better circulation of the higher spec XLC is more efficient – as it should be. 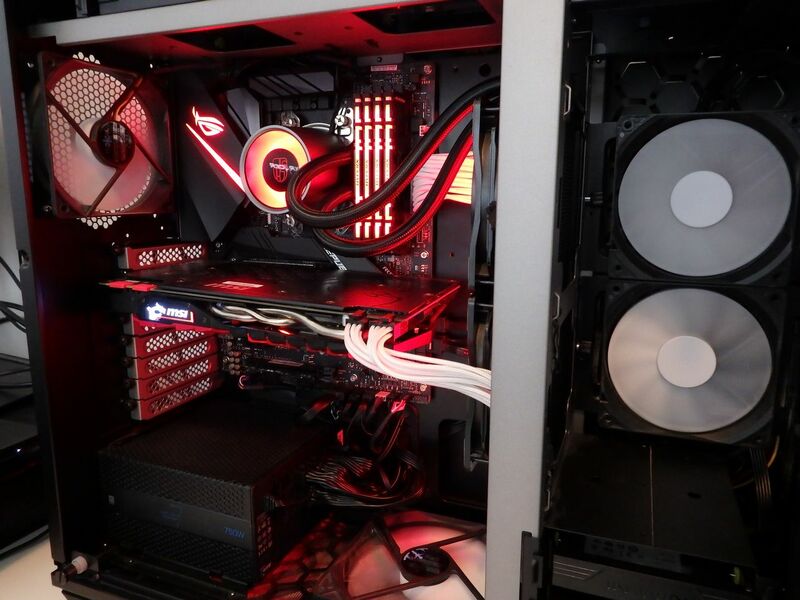 The Wraith Prism is adequate under normal conditions but can’t reliably sustain our overclock – it was game stable but didn’t deliver under a 30 minute AIDA64 stability test. 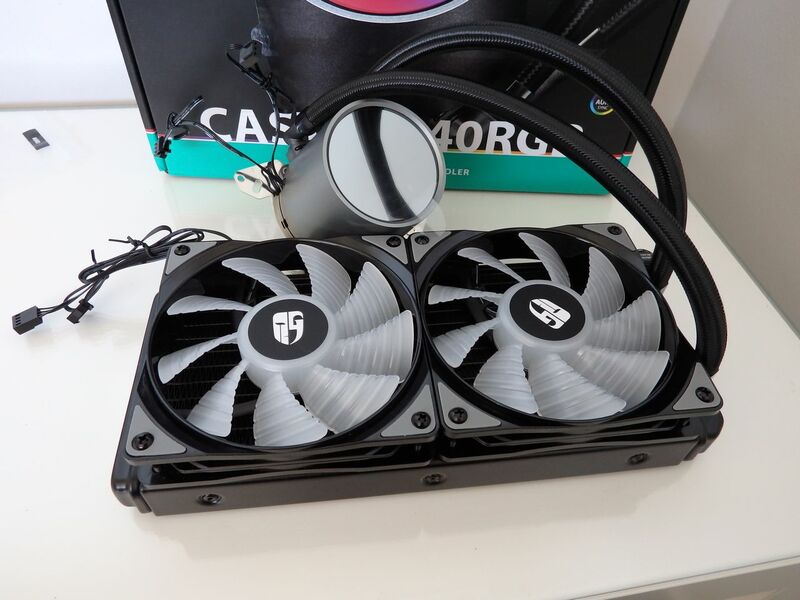 The Deepcool Castle 240RGB performed a lot better than the Wraith Prism and in fact wasn’t really that far behind the EK XLC 240 Predator cooler. 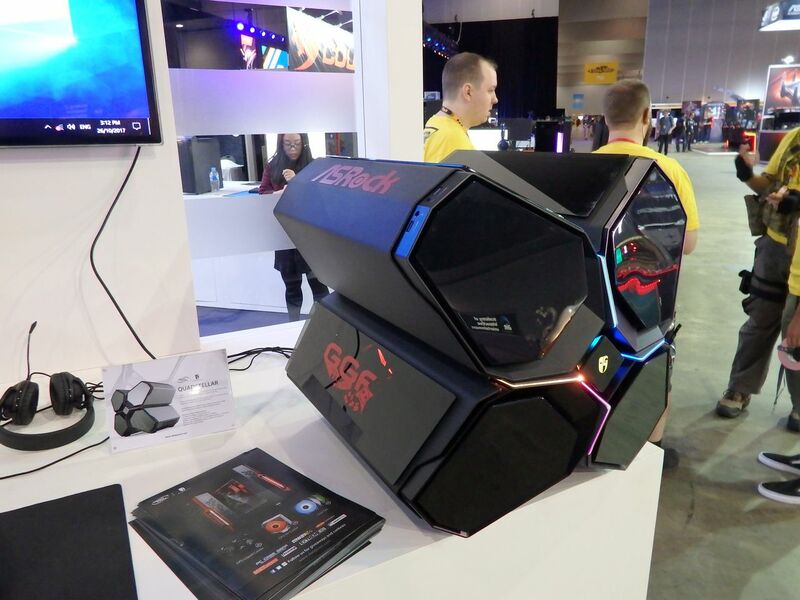 In terms of noise, the Wraith Prism was clearly the loudest but the two AIO water coolers were on par with each other at 12V. 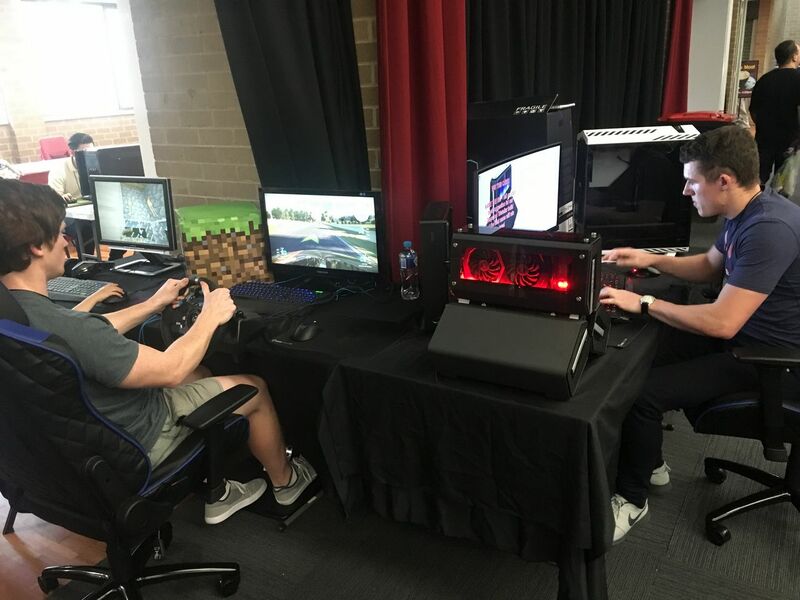 In general use, I rarely saw the water coolers running at full speed – transcoding work was the only real-world scenario that seemed to push the overclocked test system to that level. 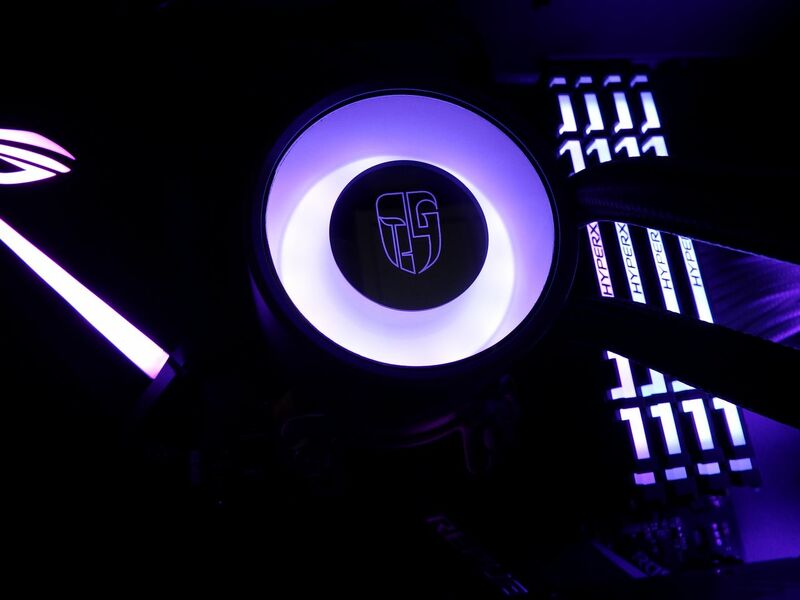 Under stock conditions with a balanced PWM fan profile, or at the profile automatically defined by the ASUS FanXpert software, the Deepcool Castle 240RGB was able to typically keep the 2700X CPU at below 60°C with minimal noise. 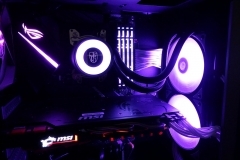 The LEDs and aesthetics of both the fans and the pump are very good. This is a significant visual improvement over the pump/block on the Captain Series. The sleeved hoses are a nice touch and display attention to detail. The performance is what I was expecting for a cooler with the radiator thickness and hose diameter. 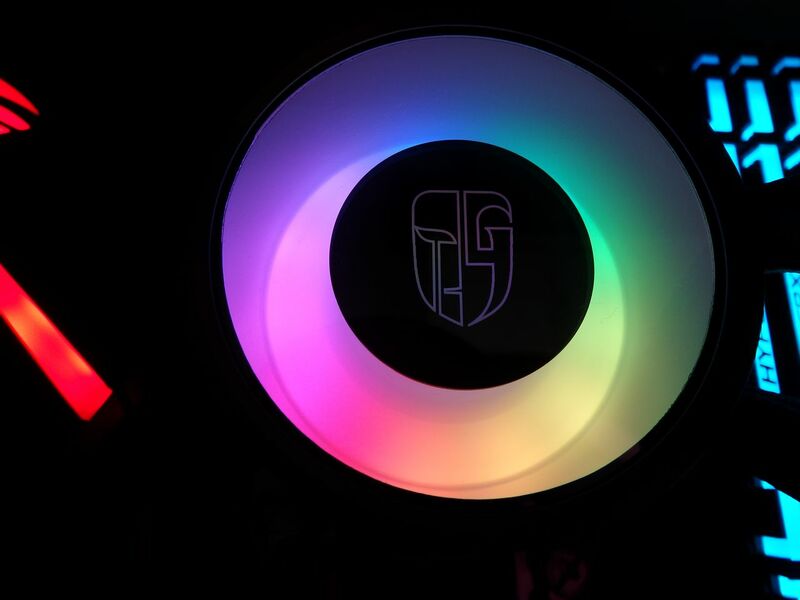 The included accessories (PWM splitter and RGB header adapters) cover all bases for builders. 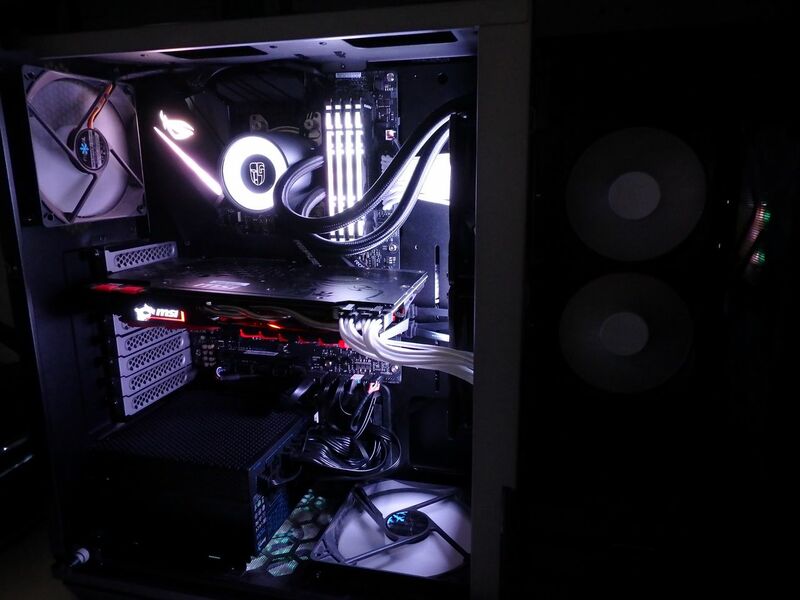 The cables were all long enough to conceal in our case and achieve a neat result. The instruction manual is very easy to follow and the bags are all clearly labelled. 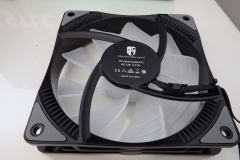 Whilst these fans are rated at 17.8~30dB(A) acoustically, on an open test bench at 30cm we registered them at up to 43dB(A) when running at full speed. 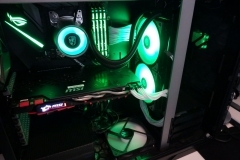 This isn’t a bad result and in a closed case and under typical operation with a mild or no overclock, the work load of the fan was low to moderate, barely audible from 70cm away. 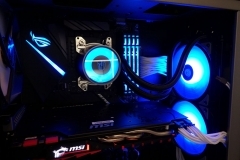 I wasn’t able to hear the pump at all and had to feel the hoses to make sure it was running – there was no ticking, whining or other running noise apparent in the testing. The LED lights can be quite bright but we were able to dim them down through the ASUS AURA SYNC software. 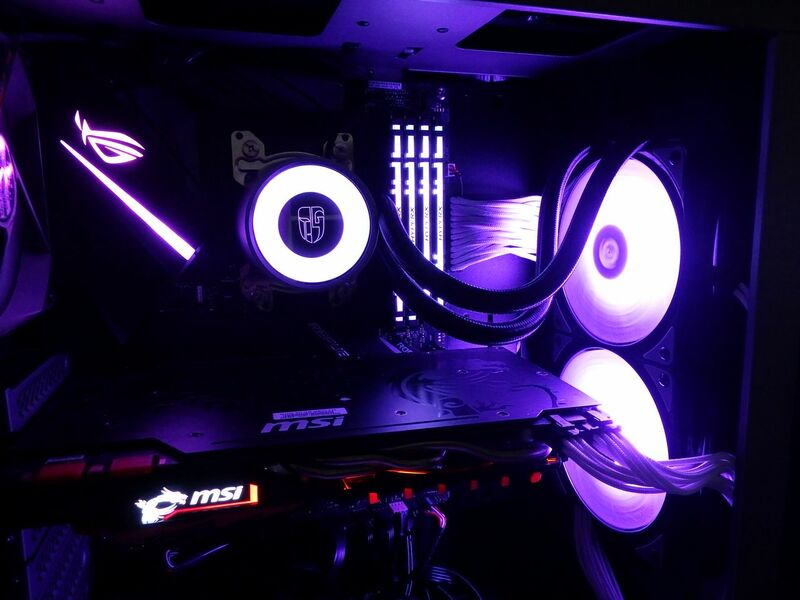 The clarity of the white was impressive and turned out to be my personal favourite but the other shades also looked good – general feedback from others in the office was that the purple, blue and red colours were also quite clear and ‘true’. 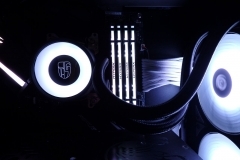 The lighting works from an RGB Addressable header and Deepcool has included adapters and extension cables for motherboard headers. 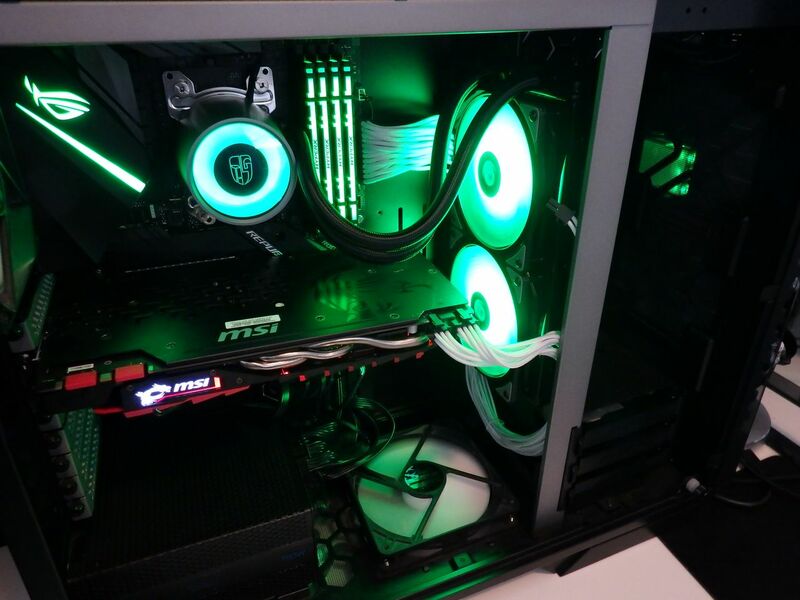 Cable routing was easier than I expected thanks to two break out boxes, one for the RGB lighting and the other for the PWM fan header. 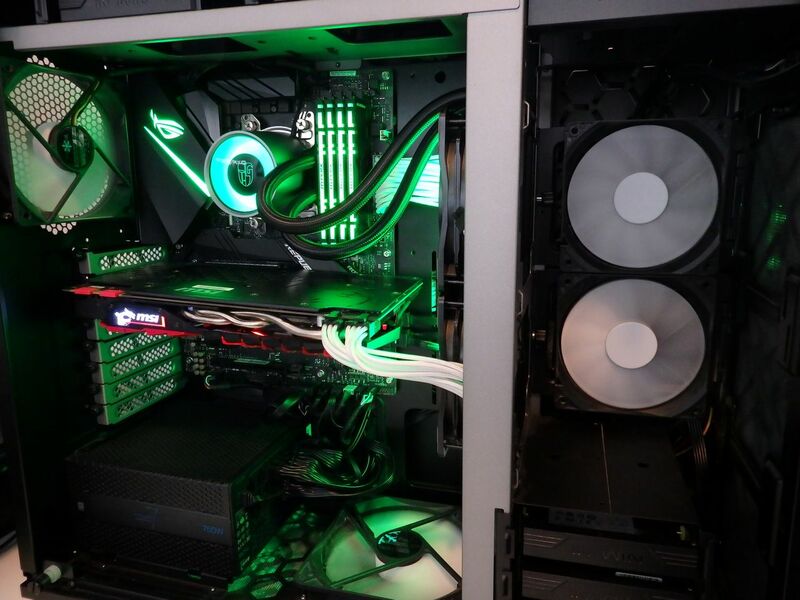 Basically, you can route your fan and LED cables to a convenient junction and hook everything up without being too limited by cable lengths. 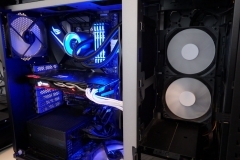 This is great when it comes to keeping a rig neat and squared away. 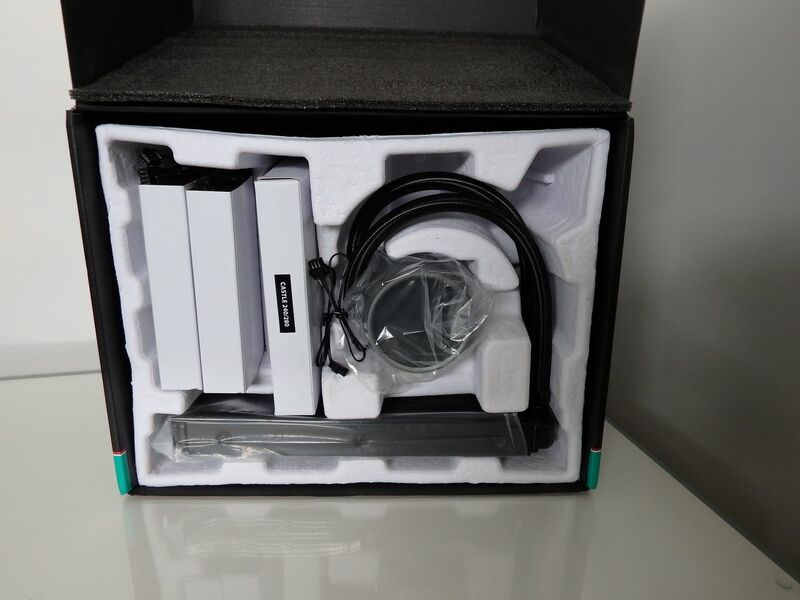 The instructions are very easy to follow and we didn’t have any issues with the mounting brackets or cables. 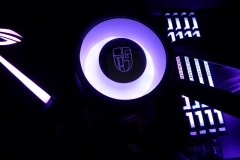 The Castle 240RGB supports Intel’s LGA20XX/LGA1366/LGA115X and AMD’s TR4/AM4/AM3+/AM3/AM2+/AM2/FM2+/FM2/FM1 sockets which means that your CPU would need to be pretty old to have compatibility issues. The brackets all come in different labelled bags to make sure you get it right. 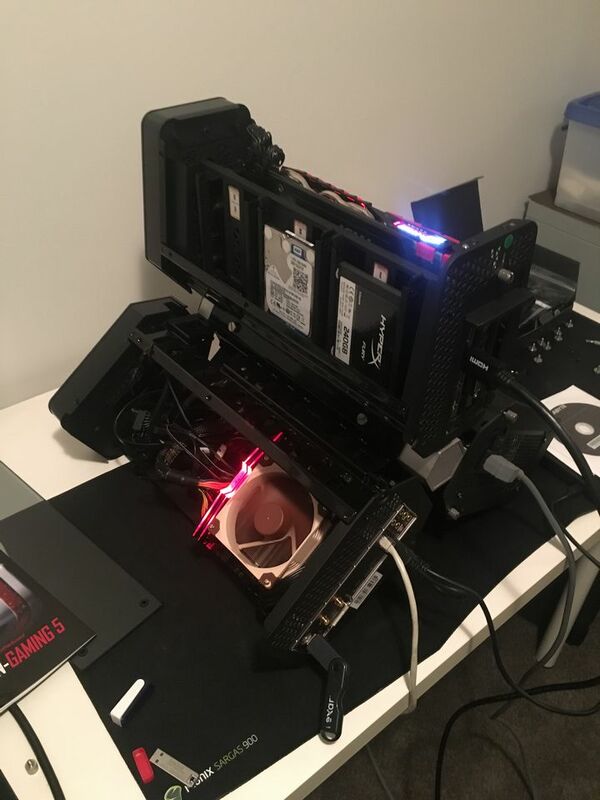 I didn’t have any concerns about the build quality. All hose junctions looked secure and there were no signs of weak points for leaking. 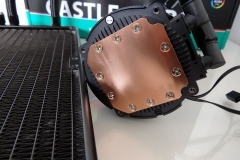 The radiator mounting screws all had sufficient purchase on the radiator to hold the unit in place. 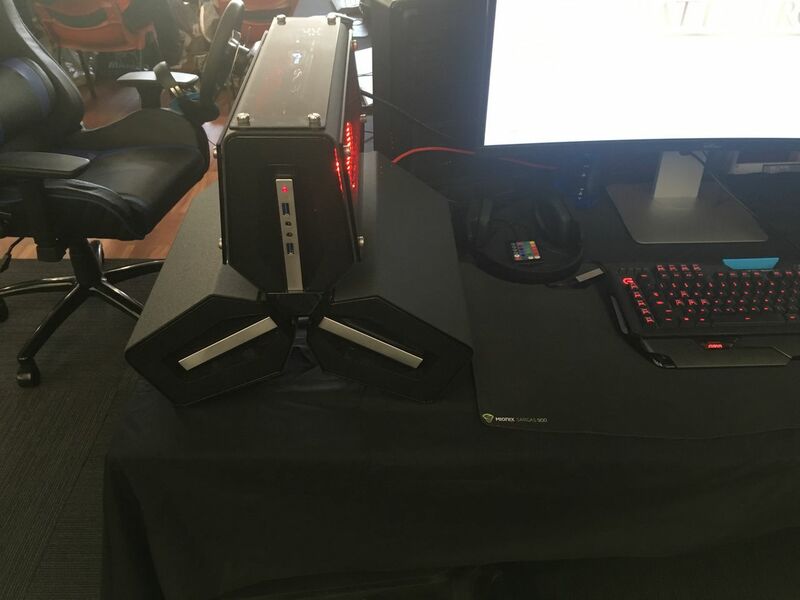 The In Win 509 chassis has a less than ideal vertical mount. 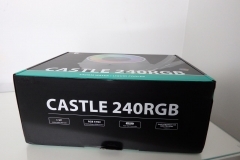 The Castle 240RGB would be best suited to a horizontal mount in the roof of a case and I could have easily tested in that way but that configuration is a given. 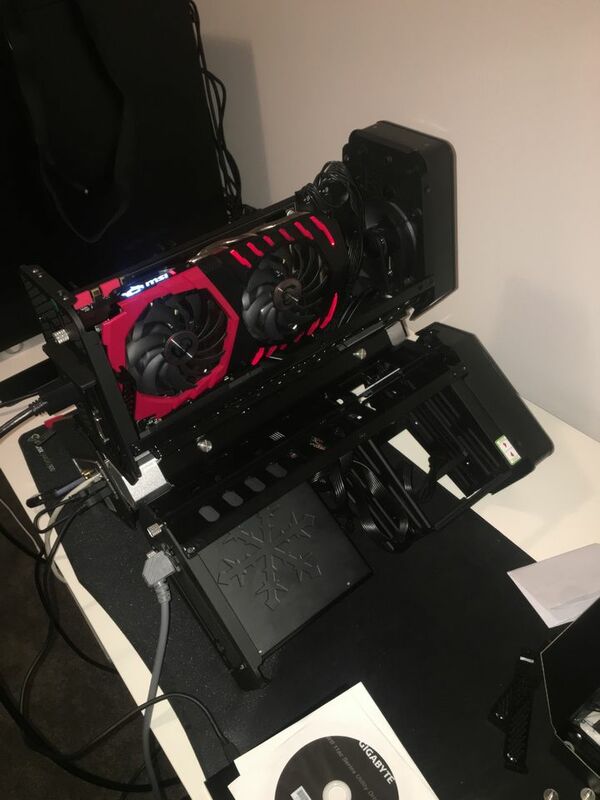 I checked it quickly in the roof of the Fractal Design Meshify C Mini but all testing was performed in a vertical configuration with hoses at the top using our ASUS ROG STRIX X470-F motherboard and In Win 509 case. I was initially worried that the firm hoses wouldn’t handle the weird orientation but they did just fine and settled into place. Mounting the CPU block turned out to be a lot easier than I thought with everything lining up as it should have. 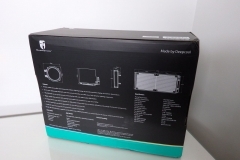 The packaging is sturdy, keeping the cooler safe in transit but not being overly bulky or large which isn’t a bad thing if you are trying to minimise freight costs. I only have one suggestion – the finish on the mounting mechanism. 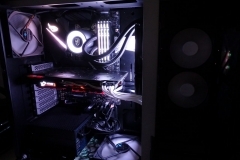 Whilst I like the mounting mechanism itself, I think that the brackets aesthetically cheapen the overall result in that they are simply polished metal when the rest of the unit is either black or grey. 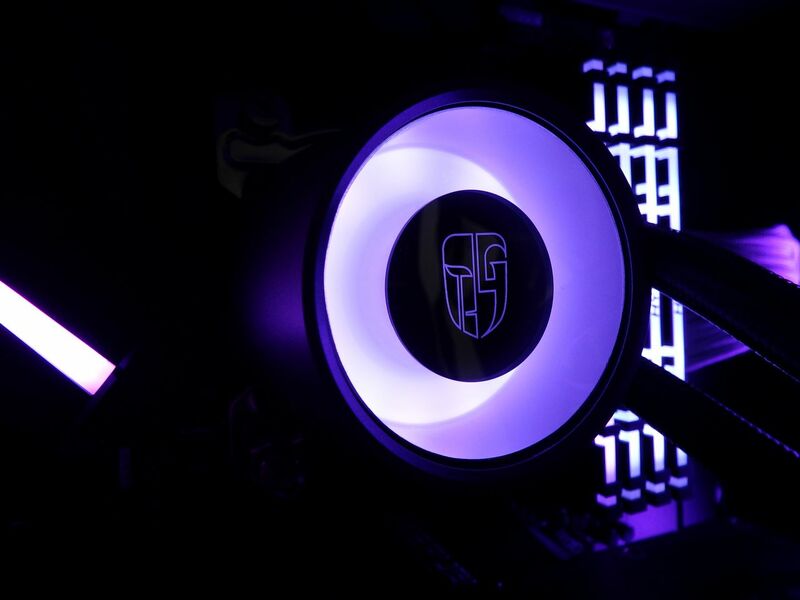 Personally, I’d like to have seen these powder coated in either black, grey or matte black. That said, the brackets could easily be spray painted by an eager system builder in a colour to suit their components as they are separate to the pump unit. 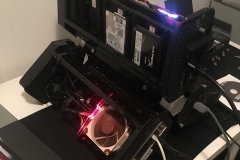 This isn’t really a problem as such – more so an observation that the shiny mounting brackets looked a little out of place to me with the sleeved/braided hoses, RGB LEDs and black radiator/fan housing. 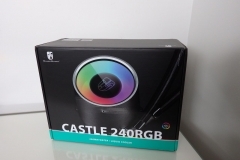 In terms of quality the Castle 240RGB was consistent from the time I opened the box, through installation, testing and finally general use. 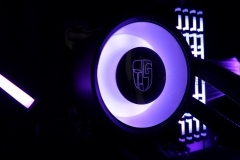 The cooler felt solid and functional with a good quality true colour RGB LED effect. 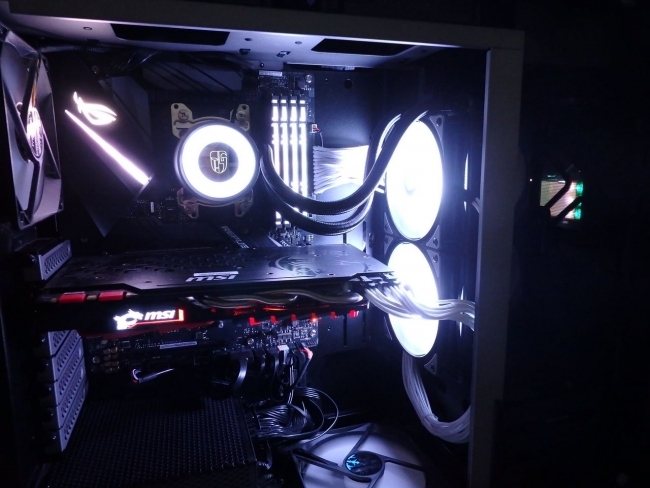 For comparison, the larger EK-XLC 240 Predator water cooler with thicker hoses, larger water block and thicker radiator felt more expensive – and it was twice the price of the Castle 240RGB when it launched. 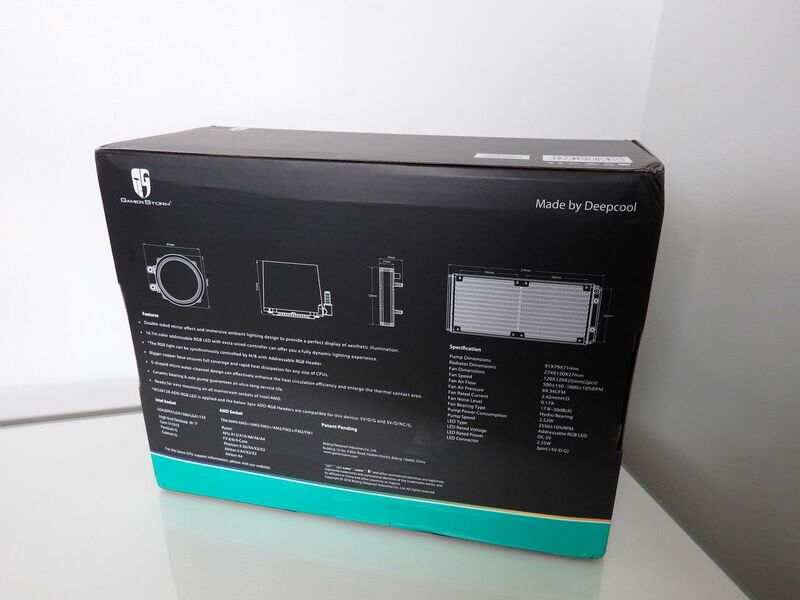 This comparison illustrates that Deepcool have priced and designed the specification of their Castle 240 cooler appropriately. 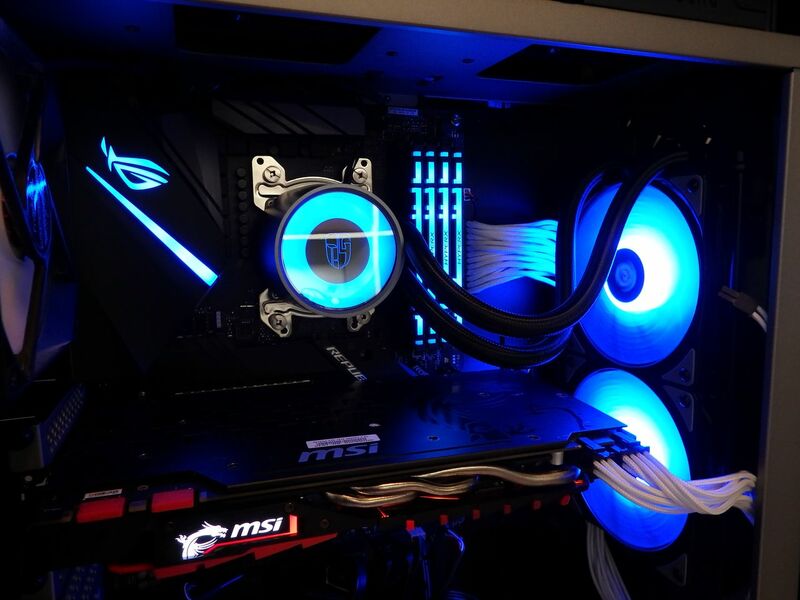 This isn’t an extreme cooler but it is a good, honest AIO water cooler that does its job whilst looking good. 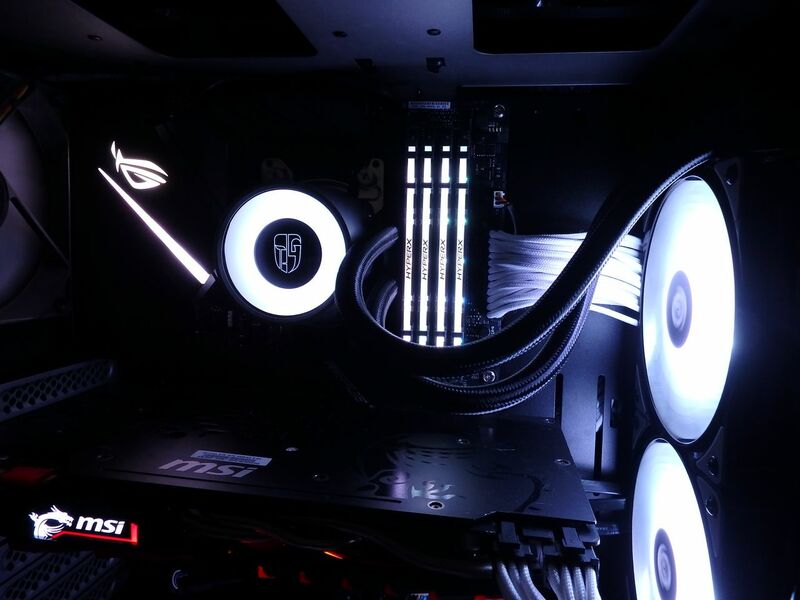 Aesthetically I really liked the end result and the effect of the opaque LED fans. 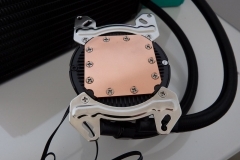 The larger copper plate on the CPU block with the ‘statement’ LED feature piece draws attention to the heart of your build. 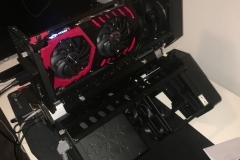 As I mentioned earlier, the mounting brackets stand out a little more being polished where a matte black would potentially disappear in most builds. 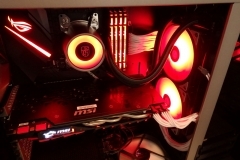 The pricing is reasonable, it kept our Ryzen 2700X below 63°C without making much noise and it looks good. 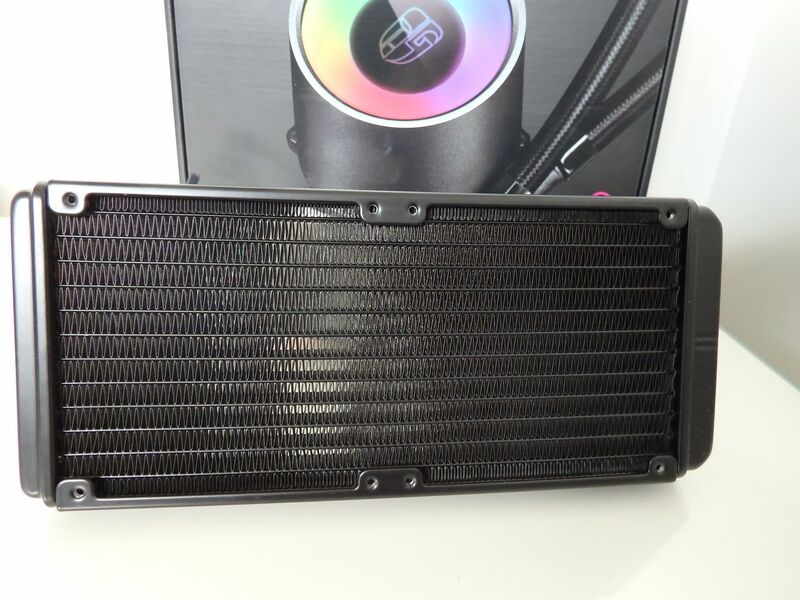 I’d like to have seen the radiator a little thicker but it performed just fine so it clearly doesn’t ‘need’ to be any bigger than it is. 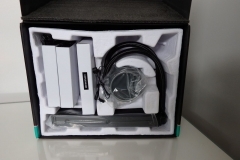 The attention to detail with the sleeved hoses, rubber corners on the fans, clear instructions, wired RGB controller for those without addressable headers and the other included accessories add to the value of this product. 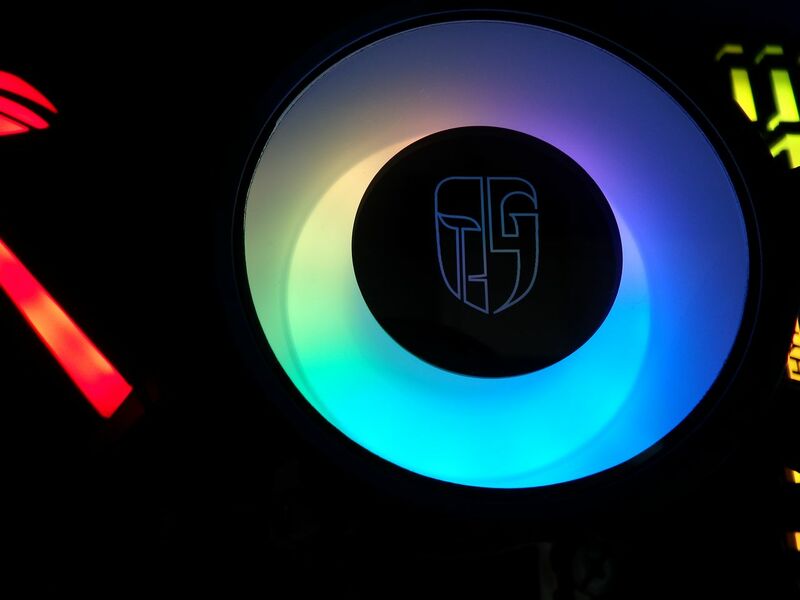 If you take the time to tune your PWM fan curve the Castle 240RGB is capable of cooling AMD’s fastest Ryzen 7 second generation CPU with a very low noise profile. 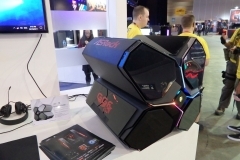 It will also handle a sensible overclock. 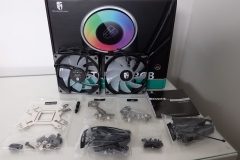 Competition : How to win our second Deepcool Castle 240RGB. 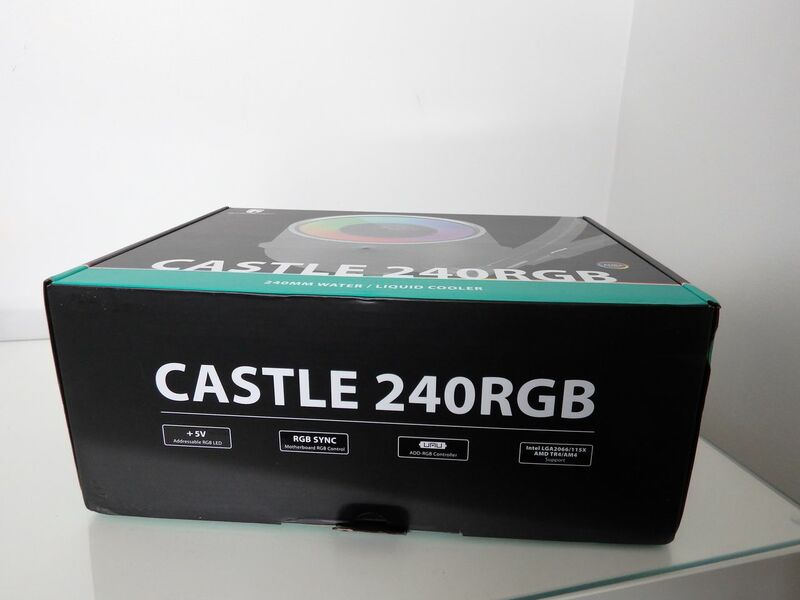 We are giving away a brand new Castle 240RGB cooler to one lucky Australian reader. 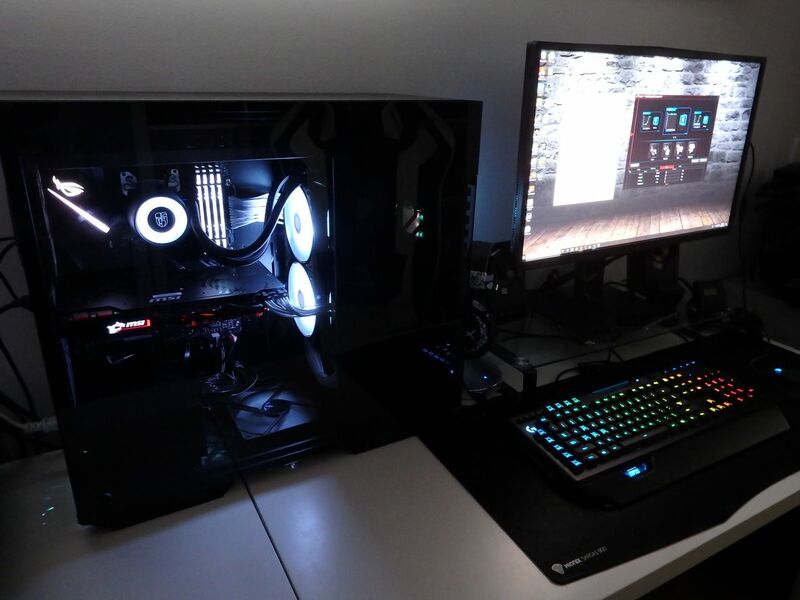 To enter, simply email us at competitions[at]pctechreviews.com.au and tell us about your dream system build in 50 words or less. 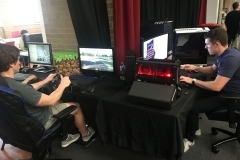 Entries will remain open until midnight, August 31st, 2018. The winner will be notified by email and will be posted on the site.